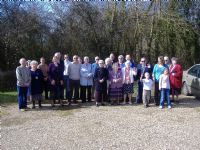 Lawshall Evangelical Free Church is a congregation of Bible-believing Christians committed to making Jesus known and better known in Lawshall and surrounding villages. Our desire is to be a loving Christian family that seeks to serve the local community and make the Christian message available to our neighbours and friends. We warmly invite you to our meetings whether you are a committed Christian or whether you are simply interested in finding out more about the Christian faith. We are affliated to the Fellowship of Independent Evangelical Churches.